Omics! Omics! : Great Galloping Gerbils! An item on CNN mentioned that satellite technology will be employed to monitor the endangered California Kangaroo Rat. This reminded me of a Nature paper this summer I meant to mention, because the image blew me away (plus it's the first time I've seen Google Earth used as a source for a scientific paper!). The paper is about models of disease spread (these gerbils are reservoirs for plague), but the thing which jumped out was the Google Earth image; the two images above are from around the same region of Kazakhstan. The gerbils clear vegetation from around their burrows, and these burrows are in huge complexes. The more zoomed in image above is several kilometers wide and yet is packed with gerbil burrows. 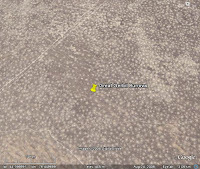 If you have Google Earth and look around 44.766991 76.449699 you can zoom way out and still see the gerbil complexes. I saw some huge prairie dog towns out west when I was a boy, but nothing on this scale! How many animals leave traces which can be seen from 30+Km up (the image quality is uneven for this region of the world in Google Earth -- clearly shots are merged from different seasons and resolutions, but 30Km is a conservative estimate)? Human activity obviously. When I think of animal-built structures I generally jump to beaver dams or termite mounds, but they aren't nearly this extensive. There was another story, too, recently. 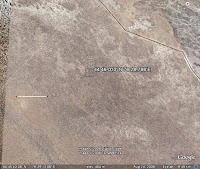 People used Google Earth to show that herds of elk and cows were generally pointed north. In other words, these animals have some kind of magnetic sensor.